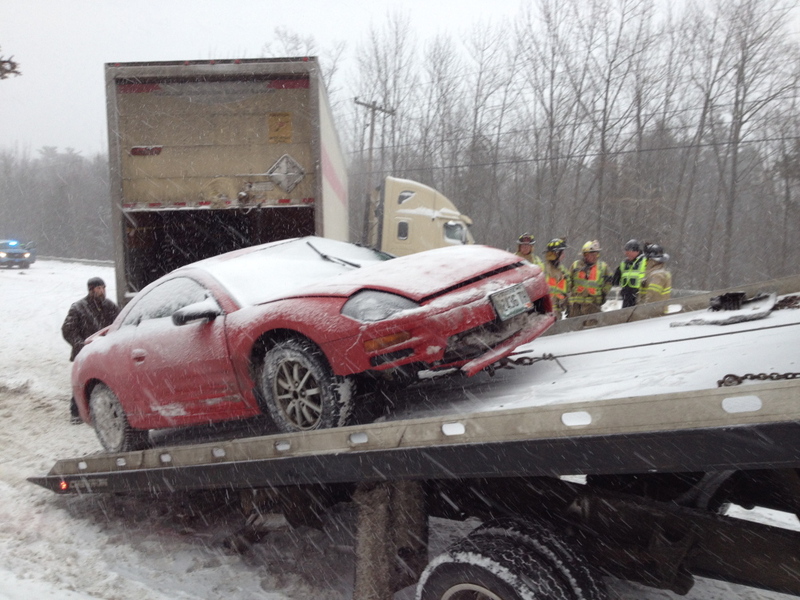 A section of U.S. Route 202 was closed because of the accident involving a car and a tractor-trailer. Several people were reported injured in a crash involving a tractor-trailer and a passenger vehicle Thursday afternoon on U.S. Route 202 in Winthrop. A section of the road between Main Street and Winthrop Veterinary Hospital was closed to traffic as emergency responders tended to the injured and wreckers began to haul away the vehicles. The tractor-trailer ended up jack-knifed across all the lanes, blocking traffic in both directions. The tractor came to rest atop a guardrail that rescuers had to cut. Once they did that, they drained the diesel fuel prior to having the vehicle hauled away by a heavy-duty tow truck. Winthrop police, firefighters and ambulance personnel responded to the accident. Information on injuries was not yet available. Shortly after the crash, which occurred about 2 p.m., emergency responders tried to find roads that could be navigated safely to use as detours. Many of the roads were coated with ice as the snowstorm began in earnest.